Have you ever driven by someone’s house with a bunch of old tires stacked up outside their garage? You know why? Because old tires are very hard to get rid of. Automotive shops charge a pretty penny per tire for recycling and disposing of them. Not only that, but you have to take the old tires back to them for them to be able to dispose of them. They aren’t coming to pick them up from you. So you’ll generally need a big truck, or a trailer to haul them up there. And you certainly can’t get rid of these old tires by setting them by the garbage with your regular trash pickup. Most the time, when someone gets a new set of tires on their car, they pay a recycling fee to the auto shop and just let them deal with them. If you have a bunch of old tires stored at your garage, house, or shop though, you’ll need to get rid of them yourself. You don’t want to have a bunch of old tires sitting around serving as a breeding ground for mosquitos. That’s where Dog Gone Junk comes in. We will come to you, load up all of your unwanted tires, and haul them away. You don’t have to do a thing, other than make the phone call and let us handle your tire disposal in Springfield Missouri. These tires won’t be put in a field and unnecessarily burned and they certainly won’t be stacked up on the side of a shed or garage. Burning tires can have a negative impact on our environment, through air, water, and soil pollution. The black fumes from burning tires contain heavy metals and other harmful pollutants that linger in the air and can lead to health hazards. 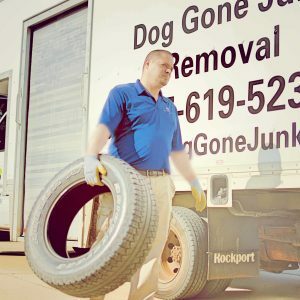 At Dog Gone Junk, we will always make sure your tires are properly recycled as to not negatively impact our environment. Get rid of those unsightly and unwanted stacks of tires and get rid of them responsibly. Call Dog Gone Junk today for a free estimate.